Terry: Have you identified approximately where the oil is originating or should we just keep making wild guesses? Advise given here is free and comes with no warranty "Caveat emptor"
[QUOTE=tlbranth;5552978]'99 GL1500SE. 144,000 miles - runs like a top. I've had an oil leak for a while and now I'm trying to find its source. Oil is quite wet on the coolant drain plug and the water pump cover is oiliest on the clutch side of the bike. There's oil on the crankcase but it's dry, oil down the side of the engine on the clutch side - drier the farther back it goes. Hard to see but I'm reasonably sure it's not a head gasket leak. I'm thinking it's the o-ring on the water pump. Terry. 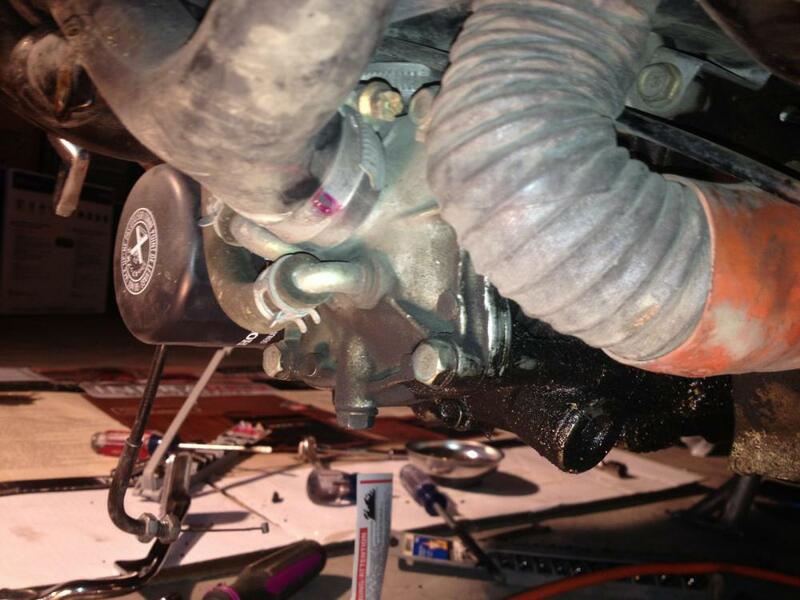 Here's a picture of an oil leak from the water pump seal. Does your pattern/spread look similar? The drain plug looks drier on this one than you describe on yours.